TORONTO - The Canadian dollar was lower Wednesday as traders reckon that a commitment by the U.S. Federal Reserve to keep interest rates ultra-low for another two years means the Bank of Canada will be in no rush to raise interest rates. 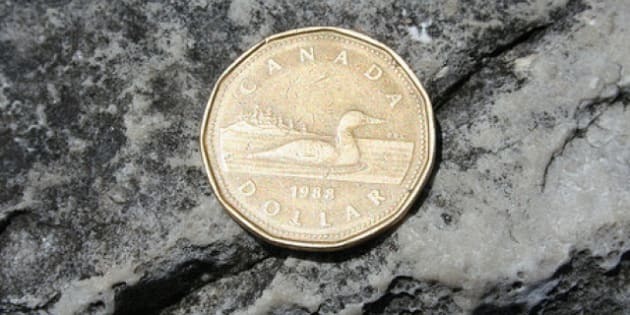 The loonie was down 1.53 cents to 100.63 cents US as the greenback also strengthened against other currencies during the morning amid a fresh round of worry about the European debt crisis. This time, concerns centred around France and the possibility that it could lose its triple-A rating on government debt. Financials in particular were under pressure amid reports that French bank Societe Generale was running into liquidity issues. It later denied those reports. The U.S. Federal Reserve said Tuesday that it would likely keep its Fed funds rate at near zero per cent through 2013 to help the ailing U.S. economy. "With the Fed on hold for as far as the eye can see, there is now even less pressure on the Bank of Canada to move on rates any time soon," said BMO Capital Markets deputy chief economist Doug Porter. "The mayhem in equities in recent weeks, and the subsequent marking down of the global economic outlook, had already pushed back rate expectations markedly in any event." The Canadian central bank enacted a series of rate hikes in 2010 that pushed its key overnight rate to one per cent and until recently, markets expected it would take rates higher later this year. The loonie has had a volatile time lately amid a selloff on equity markets that reflected dwindling confidence in political leaders and central bankers to get a grip on the European government debt crisis and the possibility that the U.S. is sliding back into recession. A downgrade of U.S. government debt by S&P last Friday served to further sour investor sentiment. The dollar is down sharply from a recent high of just over 106 cents at the end of last month, briefly going below parity on Tuesday as investors flocked to the safety of U.S. Treasurys and gold. The dollar's fall came amid lower oil prices but higher prices for base and precious metals. Crude oil prices gained ground after worries about slowing demand pushed prices down 20 per cent from a recent high of almost US$100 on July 26th. Crude was up 95 cents on the New York Mercantile Exchange to US$80.25 a barrel. Metal prices lost early gains and the September copper contract on the Nymex lost six cents to US$3.91 a pound. Investors looking for a safe haven continued to push bullion prices further into record territory with the December contract in New York up $36.60 to US$1,779.60 an ounce.